I was watching CNBC for the rate announcement this past week when I heard something that dropped my jaw, but all the talking heads seemed to smile and nod at. Bill Gross had said, and I'm paraphrasing, that the Fed would not be able to get the fed funds rate much above 2%. Another panelist said he agreed because at 3% Corporate America would have no free cash flow. I'm not surprised by this, because I know how dependent business have become on cheap money, but to hear it from the bobble heads on CNBC without the slightest reaction was shocking. It should have been a collective "wait...what!" moment. 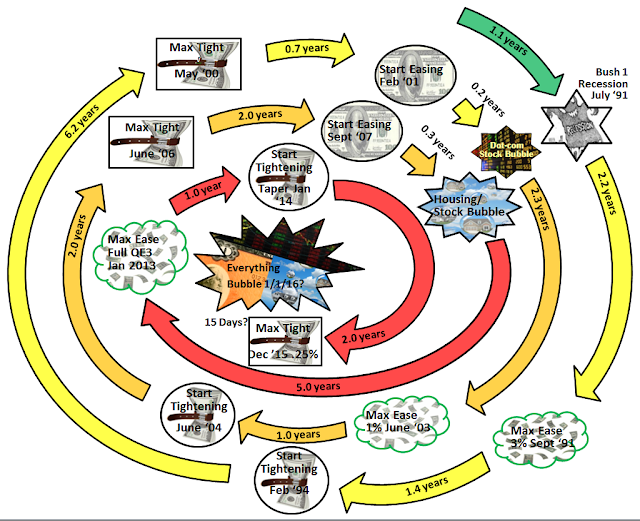 It got me thinking about past fed interest rate cycles and how it would be good to provide some charts to illustrate to myself and others what has happened, and what is likely about to happen in the near future. In the below chart I took some liberties. I attempted to determine an equivalent negative interest rate for the various QE programs based on the duration and size. It was done for continuity and is far from perfect, but it gets the point across. Oh, and when the Fed attepted to convince the markets that the taper was not a tightening of monetary policy was a joke. This should have caused any sane person to question their credibility. 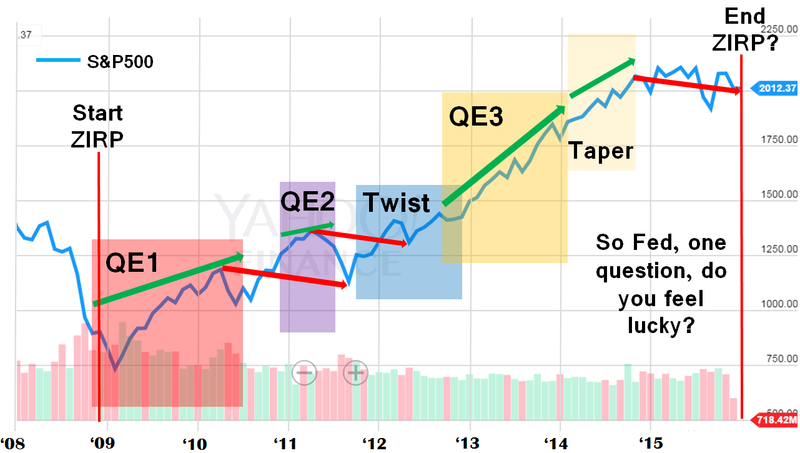 The markets were not fooled as shown here. The seeds of the next crisis are laid with the easy monetary policy put in place in response to the previous crisis. There are a couple things that pop out when looking at the chart, first is the cycle was shorter between the dot-com bubble and the housing bubble than it was between the 1990 recession and the dot-com bubble. The second is that easing does not prevent a crisis. Easing provided a warning to investors the last couple times around, but we probably won't be as lucky as we enter the end of this cycle. Half the reason the Fed raised rates was likely to convince markets that there was no danger, I don't think this has happened in the past, but I'm interested to see how it turns out. If the shortening of the cycle portends a trend put off only by the Fed acting late , we will likely skip a step (or two) before recession. The Fed has wanted to raise rates for some time, and have held off at least 3-9 months longer than most "experts" expected. This is for good reason, the Fed knows the economy likely won't withstand further tightening. In fact just as in '07 with subprime, the credit markets are showing major cracks, only this time in the corporate junk bond market. Where as in the last cycle, when these cracks appeared the Fed eased, this time they tightened! This leads me to believe that the Fed will not have a chance to lower rates prior to recession. Many think of the financial crisis as a late 2008-2009 event. When in reality it officially started in the 1st quarter of 2007. In the above charts I question whether the beginning of the next crisis/recession will officially begin on January 1st, just 15 days after the latest rate hike. We may feel the effects of the down turn rather quickly, but we won't know for sure 'til July when the 2nd quarter GDP results are released. This will give the talking heads plenty of time to pretend it's not happening. But there is also the possibility we will learn that we skipped two steps. If at the end of January there is a negative print for Q4 GDP, the Fed could have tightened AFTER the start of this crisis. 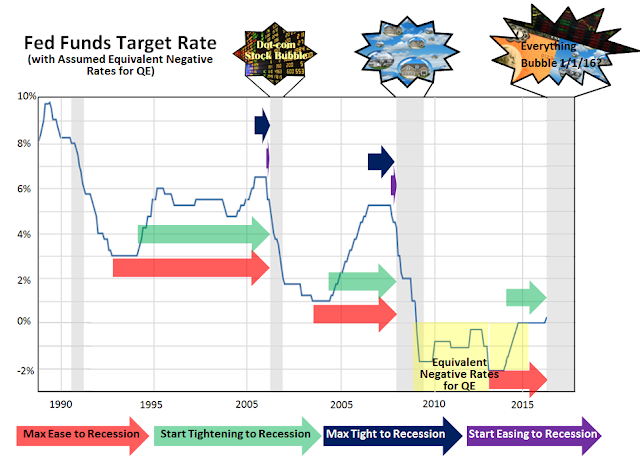 If this is the case, and the markets perceive that the fed is behind the curve, the reaction won't be pretty, but that may be by design (explained here). Of course, the dates when the inevitable occurs don't matter all that much, the seeds have been sown, and we've been circling the drain for some time. Woah that's a lot of money talk for me. Couldn't understand a thing. But my dad really enjoyed the article. He said if understood it is a very informative blog to read.